There are few wearable categories that offer up such a dizzying number of options as the fitness tracker. The number of models and brands is ever increasing, from Fitbit and Garmin to Misfit and Xiaomi, picking between them is getting increasingly tricky. Other features to take into consideration include the accompanying app software, battery life and the ease with which you can sync your data back to your phone or the web. While the fitness tracker has exploded in popularity, it's well worth taking a second to consider what you want from it. Many of the enquiries we get at Wareable from readers looking to buy a fitness tracker come from skewed notions about the data on offer. Fitness trackers, by and large, will track your daily activity in terms of steps and calories burned through movement. You set a goal of how active you want to be and they will give you a rough guide as to how successful you are. However, fitness trackers are often surrounded by misconceptions, partially fuelled by the opaque language and promises by manufacturers. While many fitness trackers will record bursts of activity, they are not adept to advanced metrics from specific sports. Those who do swimming, Zumba and pilates, for example, will only get a report of the movement or heart rate from those sessions and the calorific burn – not a break down of their performance. Another common misconception is about running and cycling. Without GPS, fitness trackers can't really accurately report on your pace or distance, and are therefore vastly inferior to a dedicated running watch. They can, however, offer a basic guide to your workouts. Things are getting better, and the lines are starting to blur, with the likes of Garmin's Vivosmart HR+ and Samsung's Gear Fit2 both packing GPS on the wrist. Most trackers, though, offer an adequate guide for occasional joggers, but are far from a training tool. While most trackers wrap around your wrist, there are dongles that clip on to your clothing and can be more comfortable to wear. Some trackers like the Misfit Shine 2 and the Withings Go (now Nokia Go) can also be worn on clips or in pockets. The Misfit Ray comes with a host of different stylish accessories that'll even let you wear the tracker around your neck like a pendant. And while the choice used to be about what colour band you went for, or whether it had a screen, smart analogue watches are now offering even more choice. Fitness tracking smarts packed into normal-looking watches is a big trend, with Fossil Q, Skagen Hagen Connected and Nokia leading the way. The Nokia Steel HR is especially strong, with continuous heart rate monitoring and 28 days of battery life. There are a handful of fitness trackers that can be taken into the pool and report on your swimming sessions. The Misfit Shine 2 (and its Speedo Shine brethren) will track lengths in the pool, while the Nokia Go can record duration and calorie burn. Fitbit has also come to the party with the Fitbit Flex 2, its first waterproof tracker, which offers you simplified swimming metrics. Moov Now will detect strokes and offer data on your technique, offering a lot more for obsessed swimmers. Neither can detect heart rate in the pool – for that you would have to move into proper sports watches. And even then, it's not all that great. You can check out our full guide to the best waterproof fitness trackers and read our swim tracker big test to find the device that suits you best. Heart rate tracking on activity bands is now commonplace, providing a big boost in accuracy in terms of the calorific burn from your day. However, the type of tracking differs hugely. The Fitbit Charge 2, for example, tracks your heart rate 24/7 and makes a note of your resting heart rate when you wake up – which is a huge metric of your improving health. It will also track your heart rate over a timed session. In terms of comprehensiveness, the Charge 2 is one of the best options, as it includes a heart rate monitor for 24/7 bpm readings, live monitoring of exercise and VO2 Max, too, so you can quantify your fitness. Garmin's fresh Vivosmart 3 does much of the same, while also placing a priority on your breathing and heart rate variability to determine how stressed you are. The Garmin Vivosmart HR, Vivosmart HR+, and Polar A360 are all options in the mix, too, if you're interested in keeping an eye on your ticker. Fitbit decided to add an OLED display to its Charge 2, while the the Fitbit Blaze got a tidy 1.25-inch colour display, which pays off when it comes to guided workouts and notifications. 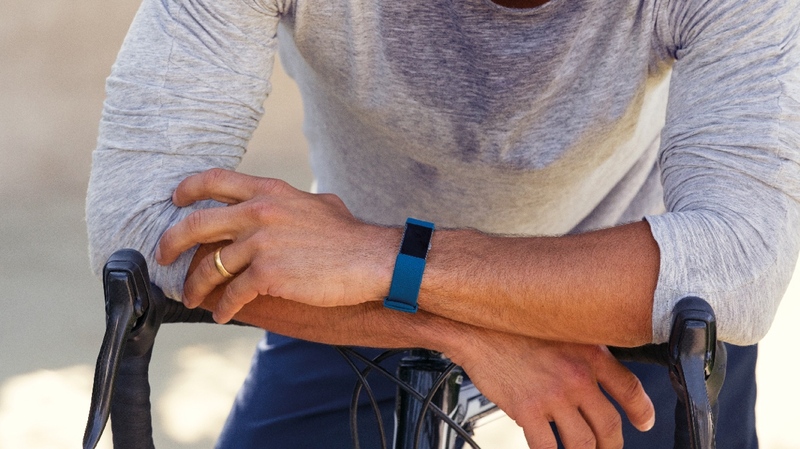 The likes of the Garmin Vivosmart 3 and Gear Fit 2 offer curved OLED displays, but information is limited. Steps taken and sleeping are the two main areas of focus for the majority of trackers, though each ban's relative accuracy is difficult to assess - these fitness trackers weigh up your movement during the day and the night and try and guess how far you're walking and how well you're sleeping. The bottom line is that the technology in today's trackers is good but not perfect. Until GPS tracking becomes the norm in fitness trackers, use them as motivational aids rather than scientifically accurate monitors. Many trackers can also make note of your workouts, swimming sessions, cycling and other types of exercise, though you'll typically need to tell your tracker what you're doing each time. The Misfit Shine 2, for example, which can be worn on your clothes or your wrist, needs a triple-tap to enter activity mode. First and foremost, check that your tracker works with your mobile phone of choice - most now support both Android and iOS. There can also be a huge discrepancy in terms of the quality between a brand's Android and iOS apps. Misfit's Android app was previously short of features compared to the iOS version, which will be of huge frustration to users who have bought there device, so check the app reviews before buying. It's always wise to check the comments from users of the app, and of course never make a purchase without reading our reviews first. Bands now fall into two camps: those that require charging every five (ish) days via a USB cable and devices that use a cell battery that lasts around six months. The range of options inside the stables of Garmin, for example, all require regular recharging, but also offer the most comprehensive metrics. It's a similar story with the likes of the Fitbit Alta HR and Xiaomi Mi Band Pulse. The Nokia Go, Moov Now and devices from Misfit, meanwhile, all use watch batteries that will need changing every six months.